Variable cutting height adjustment of 1.5"-5.5"
If you have a large area of grass to mow, you need a Swisher Trail mower! Backed by the power of 60+ years of design experience, the Swisher 60" 17.5 HP Trail mower is designed to dramatically reduce mowing time. The Swisher Trail mower attaches to ATV's, lawn tractors and any utility vehicles to cut large lawns and meadows fast. Three blades are powered by a 17.5 horsepower, Briggs and Stratton engine for a finish-cut quality, each and every mowing. A 60" side-discharge cutting deck cuts wide swaths and spreads the grass out to avoid choking. 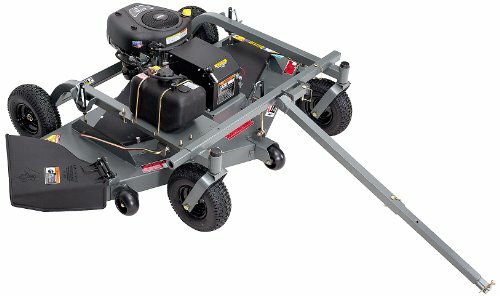 The true floating deck reduces scalping for professional mowing results, even on tricky terrain. Cutting-height adjustment handles are easy to control for just the right cut. This Swisher is equipped with a handy 12-volt key starter, so firing up the mower is a snap, rather than a big workout. A universal articulating hitch attaches to any hitch system and lets the mower maneuver easily behind whatever is pulling it. The 2.5 gallon fuel tank means less downtime and more productivity for getting the job done fast and getting back to your weekend. The Trail mower is the ultimate time saver! Not for sale in California. Made in the USA.